In my role as Alumni Director I have the opportunity to meet with amazing Auggies to share their journey and their connection to Augsburg. A few weeks ago, I had the chance to spend some time with some friends from the class of 2001. There is something really special that happened on the 5th floor of Urness in the fall of 1997. A group was formed that has stood the test of time and location. I know that so many of you have similar experiences and groups of friends you still see regularly for brunch or not-regular-enough get-togethers. 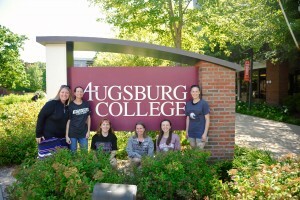 One of the things that was important for this group was to spend some of their precious time together at Augsburg visiting and reconnecting with the campus and some of the people that make Augsburg so amazing. We walked around and saw classrooms, shared memories, remembered others, laughed, and spent some money in the bookstore. One thing this visit cemented to me is how important it is to visit Augsburg. In this era of social media, we sometimes think that we know what’s going on at Augsburg. But there is something about being here physically, seeing the campus, smelling it … you wouldn’t believe how some things smell just the same (Urness) and how it makes the memories come flying back. As we approach Homecoming, I ask you to remember that it is important to come back and be here, to experience the campus and the activities you enjoyed with your friends and classmates. You don’t have to take my word for it, but I invite you to take theirs. If you’re looking to tour campus with your favorite classmates, be sure to let me know. 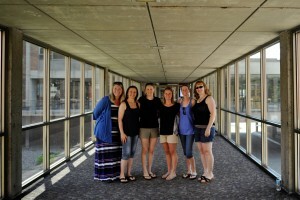 2001 grads back on campus. 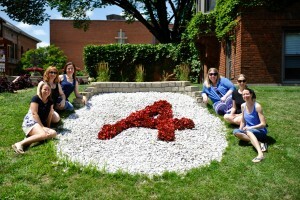 (L-R) Erica Huls, Emily Waldon, Merry-Ellen Krcil Bryers, Stacy (Waterman) Newton, Laura Waldon, Sara Thedinga. Pausing on a beautiful summer day by the Augsburg A. The 2001 grads pause for a quick photo in the link. (L-R) Erica Huls, Laura Waldon, Sara Thedinga, Stacy (Waterman) Newton, Emily Waldon, and Melon. 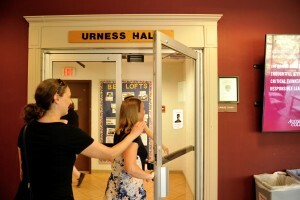 Entering Urness Hall – home to so many memories. 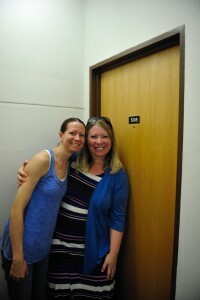 Former roommates Emily Waldon and Erica Huls stop by their first-year room in Urness. Stacy Waterman finds her former soccer coach Benjy Kent, now director of academic skills at Augsburg. 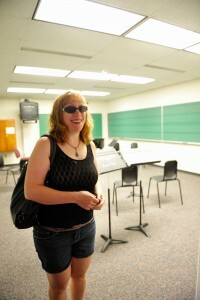 2001 music major, Merry-Ellen Krcil Bryers, a.k.a Melon, visits a music classroom. The gang visits Science 100. 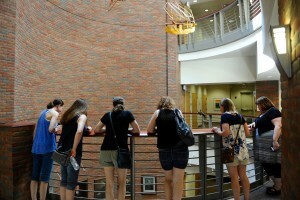 Lindell Library opened to students in 1997, the group’s first year on campus. 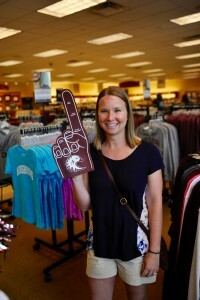 Taking a break in the bookstore, Stacy (Waterman) Newton affirms that Auggies are #1. 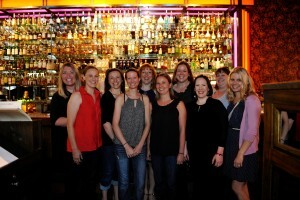 2001 Auggie alumnae gather for dinner at the MonteCarlo Minneapolis. One week before the general election, Augsburg College hosts the fall Sabo Symposium, a debate between the four candidates running for the Minnesota Secretary of State. Bob Helland (Independence), Bob Odden (Libertarian), Dan Severson (Republican), and State Rep. Steve Simon (DFL) will square off at October 28, at 7 p.m. in Hoversten Chapel, Foss Center, on the Augsburg campus. Video of the forum will be livestreamed on TheUptake.org during the event. After the event, video will be available on the League of Women Voters Minnesota YouTube page. Forum attendees may submit questions for the candidates by email in advance or in writing at the event. Emailed questions should be sent to SOSquestions@lwvmn.org by noon on Monday, October 27. All questions will be anonymous and screened by a neutral committee. To learn more about the duties of the Minnesota Secretary of State, click HERE.